With a big win and two tough home losses, the Eagles finish up their regular season in fourth place in the Scenic West Athletic Conference. On Oct. 22, the Eagles traveled to Las Vegas, Nev. to compete against College of Southern Nevada. After losing a starting player, Kayla Newman, in the second game due to an injury, the Eagles had to fight through to pull out the win. Freshman, Sara Morley and sophomore Prim Felatoa stepped up to fill the gap and lead the Eagles to the 3-1 win. Emily Bender lead with 15 kills; Sidney Springer, 12; and Jaelyn Olsen, 11. Agatha Roese had 23 assists and Mateah Tuckett had 20. Springer also scored four aces for the Eagles. Head coach, Danielle Jensen, was proud of her team for stepping up to the challenge to win the game through adversity. 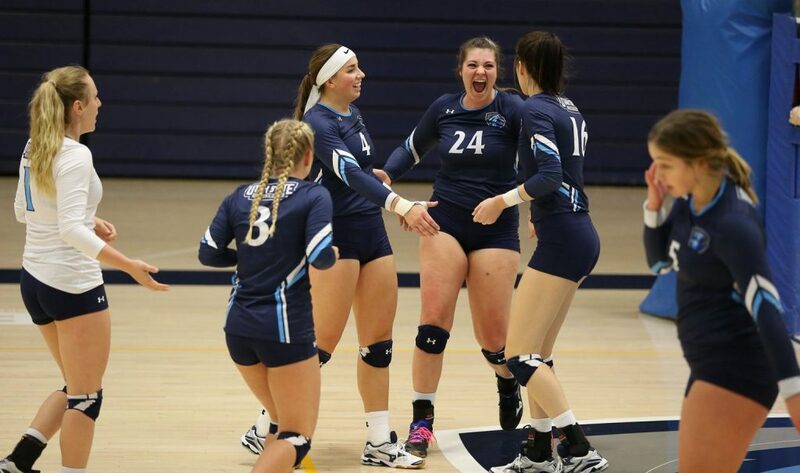 The next weekend, on Oct. 29, the Eagles took on College of Southern Idaho on their home court. Being first in the conference, CSI was hard to beat. The Eagles ended up losing the match, 0-3. Springer lead the team with 13 kills; Olsen, eight; and Bender six. Springer also lead with nine digs; Lindy Bluemel, seven; and Mckenzie Mott, seven. Olsen lead with four blocks, Morley, four; and Allie Kittell, two. The following day, on Oct. 30, the Eagles concluded their regular season with a rematch against Salt Lake Community College on their home court. The team was able to honor their sophomore players before the start of the game and talk about their plans after they leave USUE. The sophomore volleyball players also sang their own rendition of the national anthem to kick-off their last game. The Eagles fought hard, but lost 3-0 to the Bruins. Springer lead with 10 kills; Morley, nine; and Kittell, eight. Jessica Snarr and Morley had two blocks each throughout the game. Mott had 20 assists and Tuckett had 18. Blumel had 21 digs; Springer, 13; and Bender, 12. The Eagles will travel to Twin Falls, Idaho, on Nov. 4 to play in the region tournament. First-place team, College of Southern Idaho, and second- place team, Salt Lake Community College, gets a bye for the first round of games. The Eagles will first compete against the fifth-place team, College of Southern Nevada. If the Eagles win their first match, they will compete against College of Southern Idaho to determine who makes it into the championship. Third- place team, Snow College, will compete against Colorado Northwestern Community College. Whoever wins in the Snow College vs. Colorado Northwestern Community College game will then take on Salt Lake Community College. The winner of that will also go to the championship.